In the past, almost half a million Belarusian tourists annually travelled to Crimea fort the summer holidays. This tradition began back in the Soviet Union and continued on afterwards due to the low prices found in Ukraine, the absence of a language barrier and a visa-free regime. But the recent developments in Ukraine have destroyed the plans of many Belarusians for this summer. Problems with transportation and the peninsula's insecurity have forced Belarusians to seek out other Black Sea resorts, primarily in Bulgaria and Turkey. Many who cannot afford to travel to these more expensive destinations will stay at their dachas and villages this summer. According to the Autonomous Republic of Crimea statistics, from 2009 to 2013 the number of Belarusian tourists in the Crimea grew twofold. Tourist companies report that in 2013 around 400,000 Belarusians visited Crimea. Belarus took third place, after Ukraine and Russia respectively, with regard to the number of tourists who spent time on the Black Sea peninsula. Crimea traditionally played the role of a USSR-wide resort, with people from all parts of the union go thing during the holiday season. A true Soviet brand, after the USSR collapsed, it remained among the top destinations for many from post-Soviet countries. With no language barrier or visa regime, thousands of Belarusians have travelled to Crimea each year to enjoy a little rest and relaxation. Even people with modest wages were able to afford a stay, and as such, Crimea has long served as a popular and affordable option. But the recent developments in Ukraine have Belarusians changing their summer plans. A storm of negative stories on Ukraine in the Russian media tell people that tourists are robbed and their cars are being stolen. Belarusians worry that their favourite destination has become a dangerous place and now they have to think about finding another place to spend their summer vacation. As a result, tourists are returning their pre-paid tourist packages and are demanding their money back. On 9-12 April Minsk hosted an exhibition called Holiday 2014. In the past, trips to Crimea were at a part of the main showcase. Yet this time few Crimea offers from Belarusian companies appeared at the exhibition. As representatives of these companies have explained, they simply cannot guarantee the safety of their clients due to the instability in Ukraine. Lacking a stable and legitimate authority and law enforcement institutions, Ukraine has become too dangerous to travel around. It remains unclear whether people will be able to get to Crimea via Ukraine. The Belarusian aircraft company Belavia recently cancelled its only flight to Crimea. Furthermore, beginning 27 May the national Belarusian railroad company will stop selling tickets on Belarusian trains to Ukraine. This is, in part, a result of the the Crimean government not synchronising the peninsula's train schedule with the national Ukrainian railroad system, with the latter being required to stop all trains in its network to be able to update the schedule and bring them in sync. 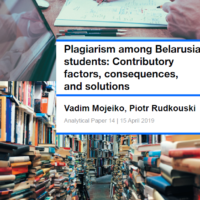 Since this was not Belarus' initiative, no one can predict the time of its the two countries renewing their ties, an issue which is problematic for Belarusian tourists looking to get away from home this summer. Another alternative is to go through Russia, but to do so, one will need additional time and money. Not only are trips to Ukraine suffering from the unfolding crisis. Trips for children to Bulgaria, which usually necessitates travel through Ukraine, are at risk of falling apart as well. Parents are setting terms with tourism companies as well: either they make a detour around Ukraine or they will refuse to pay for the trip. The companies are going to be forced to help their clients acquire Polish visas in case the situation in Ukraine will not improve. As Siarhej Dalhanaŭ, director of the Dolsan company, says, “We have become hostages of the information war. The president says that we remain friends with Ukraine, but people come home and turn on Russian TV. If we do not persuade the tourists now, they will never come back.” Indeed, Russian propaganda depicts Ukraine as a place where rule of law does not exist anymore and everything is descending into chaos. If you go Ukraine, "Banderite extremists" and the "Right Sector" will certainly stop and rob you on the road. And many Belarusians believe this. However, Vadzim Karamzin, an official at the Ministry of Tourism and Sports is not too concerned about the current trends developing in the tourist industry. He thinks that Belarusians will prefer the resorts of Bulgaria and Krasnodar Krai of Russia over their traditional Ukrainian destinations. For Ukrainians though, especially in the seaside regions, tourism accounts for a large portion of their revenues and people are not so inclined to just sit back and watch their livelihood be forsaken so easily. On 11 April the Ukrainian Embassy in Minsk gave a press conference on tourism and travel in Ukraine during the coming summer season. Ambassador Mikhail Ezhel urged the audience not to believe the Russian TV and Internet tales that portray Ukraine as being lawless and dangerous. Ukraine cannot guarantee the safety of Belarusians in the Crimea, but suggests that Belarusians visit other seaside regions on Ukraine's mainland, like in Kherson, Berdyansk and Odessa, or enjoy other resorts like those found in the Carpathian mountains. Moreover, Belarusians will be able to benefit from Ukrainian holidays also because of Ukraine's ongoing currency devaluation. Representatives of Ukrainian tourist business have also visited Belarus in order to persuade Belarusians that Ukraine remains safe. They even announced a plan to organise a tour around Ukraine for Belarusian companies to show them that Ukraine presents no danger to tourists. However, the Chair of Republican Union of Tourist Organisations of Belarus Valiancin Cechmeister predicts that this season Belarusians are not only likely to not visit Crimea, but Ukraine in general because of the nation's instability and unrest. This has also been confirmed by a spike in demand for trips to Bulgaria and Lithuania, according an interview with Cechmeister on Deutsche Welle Radio. Last week around 40 Lithuanian tourist companies came to Belarus to present their products, and the Ambassador of Lithuania himself took part in the presentation. He told the audience that the number of Lithuanian visas issued in 2013 grew by 20% to 232,000. 420,000 tourists from Belarus visited Lithuania in 2013, and each tourist spent €150 on average during their stay. In recent years Lithuania and Belarus have been developing a railroad project to reduce the travel time between Minsk and Vilnius. What was a 4 hour journey previously now takes only 2.30 – and the authorities are hoping to get that down to 2 hours. This year Latvia also expects more tourists from Belarus, due to several factors – the Crimean crisis, Latvia's similar climate and its close proximity. The Latvian State Agency of Tourism noted in its development reports that in 2013 the inflow of Belarusian tourists to Latvia increased by 37% compared to 2012. However, the Baltic Sea and its climate cannot compare with the much warmer Black Sea, so many Belarusians will look for sunny beaches in Bulgaria and Turkey. But these resorts are more expensive and will hardly satisfy almost half a million Belarusians who are used to spending their summer holidays in Crimea. Tourist companies accept that cheap Crimean offers can hardly be replaced by other destinations. Even Belarusian health resorts are more costly. For a family of three, for example, 10 days in Crimea this August would have cost around $1,000, while in Bulgaria and Lithuania Belarusians will have to pay $2,000 and even more in Turkey. It is beginning to look like many Belarusians will remain on their dachas and parent’s villages in Belarus this summer. On 10 April the Belarus Reality Check took place, hosted by the European Endowment for Democracy in Brussels. This is the third event of this series which involves a number of Western and Belarusian analysts and policy-makers. Previous events took place in Vilnius in 2012 and in Warsaw in 2013. Participants discussed how to balance the EU's willingness to improve its ties with Belarus and its inability to do much inside the country until the release of all the nation's political prisoners. Belarus Digest plans to publish a non-paper summarising the main points of the event next week.